Early on, director Darren Aronofsky’s Noah looks as if the director of movies such as The Black Swan, The Wrestler and The Fountain wants to turn a familiar Bible story into a bit of second-rate sci-fi. What else to think when watching Aronofsky reprise the Genesis story in bite-sized visual chunks. If that weren’t enough, Aronofsky later introduces giant rock creatures called Nephillim, fallen angels who stomp about the Earth like refugees from a Michael Bay movie. Part spectacle, part attempt to wrestle with Big Questions (capital letters intentional) and part the story of a family in crisis, Noah provides Aronofsky’s take on a tale in which God — always called The Creator in the movie — decided that mankind was too corrupt to preserve. You pretty much know the story. 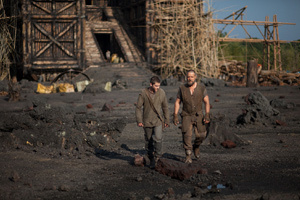 Noah (Russell Crowe) is the last good man in a rotten world. Here, he’s presented as a kind of proto-environmentalist who suspects that the world is doomed. Noah doesn’t speak directly to God, but he reads signs and omens — flowers that sprout magically in an instant, for example. Understandably troubled by the prospect of global annihilation, Noah gathers his family, and sets out to visit his great-grandfather Methuselah, Anthony Hopkins as a kind of Old Testament Yoda. Perhaps Methuselah will know what to do. Noah’s accompanied on his journey by his wife Naameh (Jennifer Connelly) and this three sons: Shem, Ham and Japheth (Douglas Booth, Logan Lerman and Leo McHugh Carroll). En route, the family picks up a young woman whose life Noah saves, Emma Watson’s Ila. Religion aside, the movie gods must be served. Perhaps that’s why we’re only about 10 minutes into the movie when Noah finds himself wielding a cudgel against barbaric bad guys. Noah, we learn, is a descendant of Seth, Adam and Eve’s third son: The murderous Cain, a better-known son of the first couple, also produced offspring, a group of carnivorous, self-serving louts led by Tubal-Cain (Ray Winstone). Needless to say, Noah pours on the special effects when it comes to the flood (death by CGI) and the arrival of the animals that Noah has been charged with saving. The creatures show up on their own, proving that Noah was the first to understand the now-popular bromide: Build it, and they will come. Aronofsky is at his most daring when dealing with the post-flood Noah. Motivated by his faith, Noah goes off the deep end, turning into a zealot who (like most zealots) goes too far. Noah thinks God has appointed him as the man responsible for wiping out all humanity and restoring the universe to its original purity; i.e., a place with no people. Other themes rise with the flood waters: The movie pits humanity’s boundless hubris against a vegetarian Noah’s deeper understanding of man’s more humble place in the universe. In an attempt to bring this already obvious conflict into even sharper focus, Aronofsky’s speculative screenplay — written with Ari Handel — finds Tubal-Cain stowing away on the ark, and trying to involve Noah’s resentful son Ham in a mutinous plot. Tubal-Cain functions as the proponent of the dark side: The Creator has abandoned the world. He and man no longer are on speaking terms. Man, therefore, is justified in grabbing anything he can. It’s not the heavens that rule the world, but man’s will. Those who have seen The Fountain shouldn’t be surprised that Aronofosky frequently attempts to operate in full visionary mode. He shows us Noah’s prophetic dreams, the snake that tempted Eve and even summarizes the evolution of humanity in a segment that seems a heady mixture of Cosmos and the Bible. Q: How did Noah care for all those animals? A: He put them to sleep by waving incense-like smoke over them. Q: How did humanity continue if Noah had only three sons? Q: How did Noah build the massive ark, which looks like a giant floating shoe box? A: Those massive rock creatures helped. We know from the outset that a message awaits: The movie finally pronounces that mercy and love are important balancing virtues to justice. A dejected Noah finds renewed hope. The acting doesn’t amount to much. An increasingly grizzled Crowe does what he can with Noah. He’s playing a character who must read the divine tea leaves. Noah finds himself in a frenzy as he approaches a pivotal incident that seems to have been inspired by the story of the sacrifice of Isaac. A little Bible story here? A little Bible story there? What’s the difference? Oddly, the only character who seems to operate with palpable conviction is Winstone’s Tubal-Cain. But he’s also mildly extraneous. With God wiping out almost all of humanity, did we need a big-screen bad guy for added melodrama? I get the problem, though. Without a little something extra what would Noah and his family do once the Earth — made as bleak and forbidding as possible — is flooded? Play canasta and wait for the waters to subside? Overall, Noah stands as a decidedly mixed achievement, less a compelling story than an attempt by Aronofsky and cohorts to illustrate cosmic ideas. And sometimes, even Aronofsky’s considerable visual skills fail him, as when he references The Creator by tilting his camera skyward.